Take Action!The Gdeim Izik 25 relates to a group of political activists from the occupied territories arrested prior to, during, and after the dismantlement of the protest camp Gdeim Izik. 19 of 25 are still in prison. The 19 detainees have since 2010 been arbitrarily detained. They have been subjected to torture, daily harassment and inhumane treatment. The Military Court of Rabat, in a mockery of justice, sentenced the 25 Sahrawi on the 17th of February 2013. 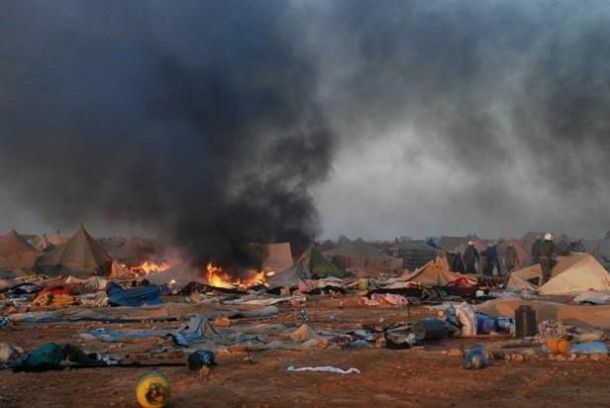 Twenty-three of the Sahrawi were sentenced to shockingly harsh sentences (life, 20, 25, and 30 years). Two of the detainees, were released with time served. However, on September 21st 2016, the Constitutional Court quashed the decision taken at the Military Court of Rabat in 2013. 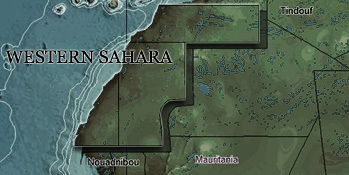 The Constitutional Court referred the case to the Appeal Court in Salé. The appeal court case commenced in the Appeal Court in Salé on the 26th of December 2016, and lasted until the 19th of July 2017. International observers conclude that the 19 detainees still imprisoned are on arbitrary detention. Download report from the trial, dated 21 Sept 2017. The 19 detainees remained imprisoned in El Arjat prison after the verdict fell on the 19th of July, until the 16th of September 2017. The 19 detainees were during the early hours on the 16th of September 2017 transported from El Arjat prison, and relocated. Neither the lawyers, the families nor the prisoners were informed about their relocation, and the location of 11 of the prisoners remained unknown for over 24 hours. The 19 detainees were on the 16th of September 2017 separated into six different prisons. Currently, the prisoners are held in Ait Melloul Prison (Mohamed Embarek Lefkir, Mohamed Bani, Sidahmed Lemheiyd, Mohammed Thalil), Okacha prison (Abdeljalil Laroussi), El Arjat prison (Eênama Asfari), Kenitra prison (Sidi Abdallahi Abbahah, Houssein Ezzaoui, Abdallahi Lakfawni, Ahmed Sbaai, Mohamed Bourial, El Bachir Boutinguiza) and Tifelt 1 and 2 prison (El Bachir Khadda, Hassan Dah, Brahim Isamili, Cheick Banga, Khouna Babeit, Abdallahi Toubali, Mohamed Lamin Haddi). Their trial was a travesty of justice. All of them have been arrested on the back of a peaceful mass protest that was violently dispersed by the Moroccan army. The charges against them? Violence. Help the Gdeim Izik 25!